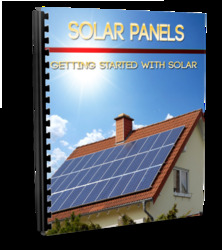 The largest contribution is due to heat transfer over non-zero temperature differences between the cycle components and their associated thermal reservoirs. The Brayton cycle utilizes a gas (e.g., air, He) as the working fluid which, unlike the water Rankine cycle, is directly heated by the primary energy source. The latter can be either a combustor wherein hydrocarbon fuel burns in air, or a nuclear reactor, in which fission energy is transformed into heat that is removed by the flowing coolant gas. These two variations are shown in Fig. 4.13 along with the T-S process diagram for each. The combustion version is not a true cycle in that the coolant air is not recycled to the inlet of the compressor, which draws in fresh air. With the nuclear reactor heat source, the coolant is high-purity helium, which is recycled to the compressor after passing through a cooler. In the combustion version, the hot exhaust simply dissipates heat to the atmosphere. In both cases, states 1 and 2 are at a high pressure pH and states 3 and 4 are at a low pressure pL. 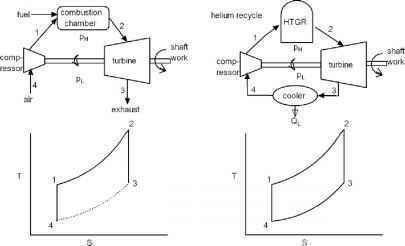 The output of the turbine (WT) is divided between the net work produced by the cycle (W) and the work required to operate the compressor (WC), or W = WT - WC. The 1st Law for the cycle is W = QH - QL, where QH is the energy delivered to the gas by the nuclear reactor and QL is the heat rejected to the low-temperature reservoir. This cycle utilizes a condensable fluid such as ammonia (NH3) or freon and resembles a reverse Rankine cycle. 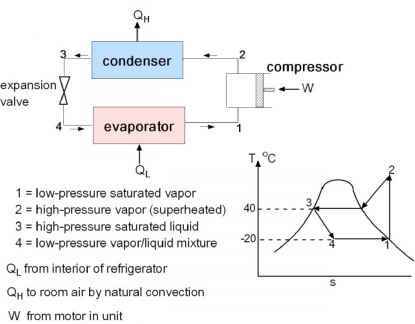 A typical refrigeration cycle is shown in Fig. 4.14. The heat extracted from a low-temperature reservoir converts a two-phase mixture to saturated vapor, which is then compressed adiabatically and (nearly) reversibly. On the T-s diagram, the line from state 1 to state 2 is shown as isentropic. The condenser rejects heat to a high-temperature reservoir and in the process converts the superheated vapor to saturated liquid. The final unit is an expansion valve which, by reducing the pressure of the flow, evaporates some of the liquid to produce the two-phase mixture for the cycle to repeat. This component is highly irreversible, which accounts for the tilt of the 3-4 arrow in the T-s diagam. states 2 and 3 approximate an isobar. Similarly, the enthalpies at states 3 and 4 are equal because of the 1s Law for a flow device (the expansion valve) with no heat or work exchanged with the surroundings. Finally, the compressor is assumed to be both adiabatic and reversible, so the entropy at states 1 and 2 are the same. T2 is fixed by intersection of the isobar originating at state 3 and the isentrope starting from state 1. The power requirements for a typical household refrigerator with this COP, a cooling capacity (QL) of 3.1 kW and a freon flow rate of 0.03 kg /s is 3.1/3.2 ~ 1 kW. The two classes of flow devices differ in two principal ways: fluid velocity changes and reversibility. In both cases, the open system consists of the section of pipe containing the constriction and imaginary surfaces perpendicular to the flow direction that are sufficiently far upstream and downstream to escape perturbations of the flow by the device. The inlet fluid condition is completely fixed (thermodynamic state and velocity) and the outlet condition is partially specified. The First law, and if applicable, the form of the Second law for reversible processes, are used to calculate the remaining downstream conditions. 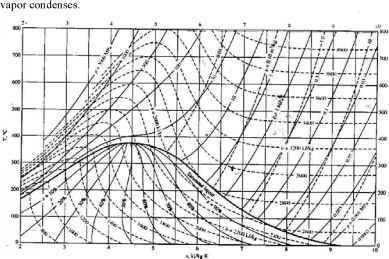 The mass flow rate is constant in time, so the analysis is on the basis of a unit of flowing mass. Suppose, however, that the downstream pressure is specified as 1.0 MPa, In this case, he is greater than the enthalpy of the saturated vapor, and the downstream steam remains superheated. To determine the final state of the gas, steam table A.3 is entered with the combination pe =1.0 MPa, he =2785 kJ/kg, which yields a downstream temperature of 183oC. That flow through an orifice is irreversible seems intuitive because of fluid turbulence (or at least laminar friction) created by the abrupt reduction in flow cross section. This qualitative assessment can be verified by comparing the entropies of the gas before and after passage through the orifice. At 8 MPa and 300oC, steam table A.3 gives si = 5.79 kJ/kg-K. For the downstream condition (pe = 1.0 MPa, he = 2785 kJ/kg), se = 6.60 kJ/kg-K. Thus, se > s;, proving that gas flow through an orifice is indeed an irreversible process. In order to relate the constant-entropy condition of this particular of open system to the changes in pressure and temperature of the ideal gas, Eq (3.14) is employed. Even though this equation was derived for changes in a closed system, it is applicable to open systems as well. The reason is that this equation involves only thermodynamic properties, and so depends only on the initial and final states of the fluid, not on the process that caused the change. Another way of viewing isentropic flow is to imagine that the flow consists of small packets of fluid acting as closed systems undergoing reversible adiabatic expansion or compression as they move from the inlet to the outlet. Once Te is determined from Eq (3.14), the First law can be applied to complete the solution of the problem. Example: What are the exit temperature and velocity of steam flowing through the nozzle of Fig. 4.15(b)? The specific heat of steam (Cp) is 33 J/mole-K (Fig. 2.4) or 1833 J/kg-K. The heat capacity ratio CP/CV = 1.337.